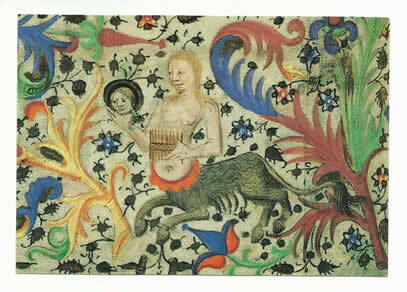 French Book of Hours - 15th Century. Bodleian Library, Oxford. "The constellation of stars shine to man's common humanity and to all enduring archetypes." Dane Rudhyar's interpretation speaks of the "nearly unchanging patterns of star-groups ... opposed to the sequence of ever-changing fashions and social ideals. The keword here is PERMANENCE." Looking more closely, we see that Chariklo completes a near-totally-perfect six-pointed star configuration, involving seven planets! These are quite rare, and are usually only approximate. Chariklo is currently in Capricorn, already within orb of conjunct Pluto, through 2018. Saturn and Pluto will make a single conjunction on 12.1.2020 at 22.46 degrees. Then Chariklo will be conjunct Saturn on 16.2.2020 (the day after her Solar Return! ), staying within orb of conjunction with both Saturn and Pluto until 2022. 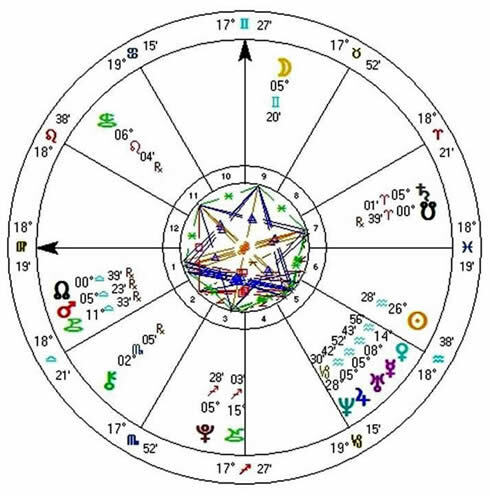 During this period, there will also be a conjunction of Jupiter and Saturn in the 1st degree of Aquarius!! Click here to download a pdf file which notes this information 2018-2022.
Who is this celestial being whose current aspects are so interesting ...? The details of Chariklo are very scant in the classical mythology, which leaves plenty of room for us to sense into her energy for ourselves. Perhaps we can imagine her being the one who cared for Chiron during his long life dealing with a wound he could not heal, and continuing to act as a healer and mentor for others. Eventually, his fate resolved when he changed places with Prometheus ... and Chiron was immortalized in the constellation of Centaurus. We are not told what became of Chariklo ... did she return to being a water-nymph, as her life had begun? Did she join Chiron in his celestial home? Does she live on as an 'eternal helper' in another dimension? Gift for creating or holding 'sacred space'. This can be instinctive, or through learned skills. A temenos, container or alembic within which the 'work of soul' is facilitated. Ability to witness. With Chariklo strong in a horoscope we find people doing the often 'invisible' work of caring for those who are in transition ... being born, giving birth, dealing with illness or dying. Chariklo is a midwife. Literally, as in physical birth and death, or metaphorically when we 'die' to an old identity or way of life. A deeply yin energy, out of which new yang is born. Recognition of the silent power of this profound receptivity. As a 'character', we find Chariklo representing a reservoir of compassion, devotion, discernment and presence. Being dutiful, consistent, supportive, forebearing, kindly and nurturing. Summary: to 'bear with', abide with, create sacred space, accompany and witness. See if you can detect this energy, deep within you. For it is she who will accompany the intense pressure of the forthcoming Saturn-Pluto conjunction, which will be within range from January 2019 until October 2021. We are already easing into it now, with Chariklo applying to the conjunction with Pluto by only about 2° at present (aas of June 2018). Perhaps she will mitigate the intensity. Or teach us how to let go of reactivity and instead 'bear with' our feelings, so that clear action can follow. Or shed light on the Saturn-Pluto process itself, which may already be echoing back, re-minding us of late 1982, when the previous Saturn-Pluto conjunction was exact, on November 8th. What led up to that 1982 time for you? And what happened afterwards? Can you see/feel/sense life-threads connecting you to that period of time? Are there processes which need resolution and closure? Or perhaps something is returning that was 'buried by circumstance'. Or something maturing, for which we feel a deep gratitude? A recording of material on Chariklo is available for purchase on this link here. The talk was given in November 2017 at the Astrological Lodge in London, and the 'bundle' contains ephemeris material to enable you to find out where she is in your horoscope and also to follow where she is now.